Our 400 year old inn has been fully refurbished to give a stylish contemporary feel which enhance the many original Seventeen Century features. Located less than a 2 minute walk from the town square we are ideal for both business and pleasure. The main tourist attraction is the world famous Warwick Castle which is just a 10 minute walk away. 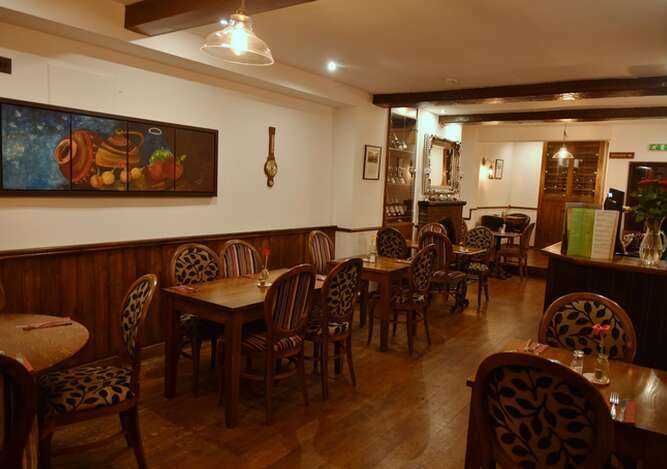 There are two drinking areas which both have ample seating for dining which are adorned with historic pictures of Warwick. There is also an attractive Vine Garden with a seating area underneath the pergola which is attractively lit up in the evenings making it ideal place to sit on a summers evening. We serve a variety of food to suit all tastes freshly cooked to order from Monday to Saturday. The rooms have been refurbished offering every modern convenience, each of the rooms are unique and many of the original Seventeenth Century features have been retained giving them their individual characteristics. All rooms have en-suite bathrooms - with shower or bath. Every room offers digital television, tea and coffee making facilities, hair drier with ironing facilities also available. There is also access to free WIFI throughout the building. We also have a secure private car park.